Do you seem to have a hard time keeping track of your students LIFEPAC grades and scores? Hunting for some resources that will help you document this important homeschool information in a few easy-to-find booklets? Then look no further. 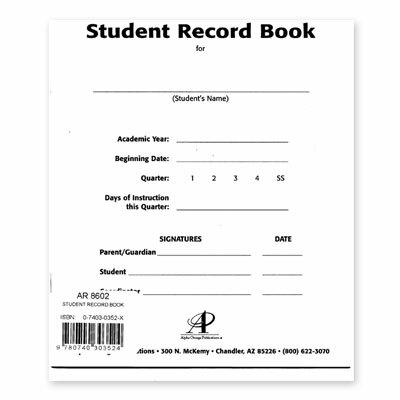 Alpha Omega Publications has exactly what you need—the LIFEPAC Set of 4 Student Record Books! These handy booklets, each made for one quarter (or half-semester), contain column sections for recording the number of instructional days, daily assignments, test scores, and additional miscellaneous assignments. Including clear instructions, these easy-to-use booklets also include log sheets for tests and self tests in each LIFEPAC subject, along with a daily log for each day of the week. What could be better? So if you've been looking for Alpha Omega curriculum reference booklets to record your student's LIFEPAC grades and scores, the LIFEPAC Set of 4 Student Record Books is the perfect solution! Not only will you be able to easily keep tabs on your student's progress with these booklets, but you will also have this important information recorded for state regulations and for future purposes like enrolling your student in college. Isn't that reassuring? Imagine not having to scramble around for grades and scores anymore! With the LIFEPAC Set of 4 Student Record Books, youll have everything you need to record homeschool grades for one full year with these four, easy-to-locate booklets. So if you're still recording grades in a hard-to-read notebook or spreadsheet, or worse, not at all, you need to get the affordable LIFEPAC Set of 4 Student Record Books! Place them in your cart today!